"“The Norwegian Nobel Committee has decided that the Nobel Peace Prize for 2009 is to be awarded to President Barack Obama for his extraordinary efforts to strengthen international diplomacy and cooperation between peoples. ”Time for a reality check! Mort Zuckerman recently wrote an article in which he does an overview of Obama’s foreign policies a year and a half after the above announcement from the Norwegian Nobel Committee." 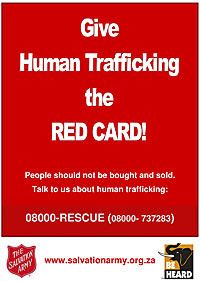 "WHILE world audiences focus on a black-and-white football (soccer ball) in the FIFA World Cup, The Salvation Army in South Africa is handing out red cards against human trafficking." 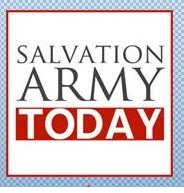 "ONLY four months after The Salvation Army officially began work in Sierra Leone its first 25 soldiers were enrolled in a meeting featured live on national radio. 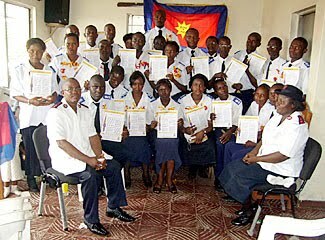 Captains John and Rosaline Bundu left Liberia in December 2009 to begin Salvation Army ministry in their home country of Sierra Leone. The work was officially recognised on 1 January 2010." This is the 19th in a series of Pastoral Letters from the General to every Salvationist across the world. The Pastoral Letters are intended to be distributed unchanged and entire to all Salvationists and may be shared also with others interested in the sacred purposes for which God raised up The Salvation Army. This comes to all Salvationists with my strong, ongoing affection in Christ for you, and with my prayers for your effectiveness in the sacred calling that God, in his supreme wisdom, has placed upon the peoples known as Salvationists. It has been laid upon my heart that I am to take a step of obedience under God by reaching out to you all through Pastoral Letters written from time to time. I write therefore in order to obey the One who has created us all, and with a longing that what is written will affirm, encourage and inspire you. The themes for these occasional Pastoral Letters continue to be the themes God reveals. His holy will is made known in many ways. I pledge myself to be mindful that his will is often revealed through interaction with members of the Body and not only or always in the seclusion of the place of prayer. It is my deep hope that each Pastoral Letter will be read wherever Salvationists are to be found, whether in private or in public settings. The chosen themes may prompt discussion, prayer and – as appropriate – action. This 19th Pastoral Letter comes to each of you with warmest good wishes and greetings in the Lord Jesus Christ. As I prepare this letter in an upstairs room in my home in London, England, I look out to see the green and blossoming evidence of late spring. The trees are suddenly abundant in leaf. The sky is lighter and the days grow longer. We discern the hand of God in nature once again and we are filled with gratitude. Readers in the southern hemisphere are in autumn, waiting for the darker nights and colder temperatures of winter to arrive. The seasons march on with seemingly inexorable pace. We feel our smallness, our creatureliness, and we sense too the overarching mind of the Creator in it all. Little wonder then that we can burst into song to declare: ‘How great Thou art!’ We offer praise amid the awe. We bring to God our smallness, ready for him to help us rise in Christ to all the fullness of what we can be. Now suddenly my mind is racing off in another direction as I see the word ‘count’ appear in my script. The Bible tells us that even the number of hairs upon our heads has been counted and is known to God in Heaven. This is a powerful reminder of God’s intimate knowledge of us. I find it enormously comforting, but many find the thought menacing. Not everyone wants a Creator God who interacts with us. Instead they seek freedom to wander, licence to please themselves, falsely supposing this to be freedom. Our God is a counting God. We see this in Jesus who spoke about a flock of sheep numbering 100, but one was lost thus reducing the flock to only 99. The shepherd would not rest until the lost one had been found. That lost one is you. It is also me. We are ‘Sheep Number 100’! How good that we have a God who can count and who searches tirelessly for us when we go missing. This divine attribute is ever before us when we do the sacredly routine work of counting how many folk are in a worship meeting, or how many have used the Mercy Seat, or how many names appear on the soldiers’ roll and other rolls. If our Creator is by nature a God who counts, then we in turn must expect also to be like him. We can count our blessings, we can count the days he has allotted to us and give thanks for each one of them. God stands alongside us as we count. He knows how many Army soldiers and junior soldiers there are in the world, and how many there are in your local corps. He knows the number of Army officers in the world and the number of cadets in our training colleges. He loves to see these numbers grow. He knows too that we are at work now in 121 countries of the world. Best of all he knows personally and in detail every individual soldier, junior soldier, officer and cadet. He knows those who are his. We bask in this knowledge. Commissioner Helen Clifton joins me in greeting each of you in the precious Name of Jesus. I commend each one of you to the grace of Christ. In connection with the Cape Town Congress 2010, the Lausanne movement invites to a global conversation about different topics. Here is one of the papers. You are invited to take part in the conversation. "Biblical forgiveness is largely overlooked in teaching the basics of faith and life application, yet forgiveness is foundational to spiritual life and witness. Forgiveness - The Possible Impossibility reveals truth, unmasks distortions, and presents application of biblical forgiveness that brings glory to God and spiritual growth to disciples of Christ"
God is a delusion – a ‘psychotic delinquent; invented by mad, deluded people.” So believes Dr. Richard Dawkins. On the BBC radio, speaking of God he said, “This infantile explanation belongs to an earlier, superstitious era in the history of humanity. We’ve outgrown it.” Dr. Dawkins believes that Christian belief is “a persistently false belief held in the face of strong contradictory evidence.” These are strong statements and they are public. The New Atheists, and those influenced by them are secular missionaries. They are sincere, they are motivated, and in many cases, they are passionate. The trickle down effect of their ideas, books, blogs and influence are seen in movies, TV, and are picked up anecdotally by any who need a convenient excuse to avoid what Socrates called “the examined life”. How to respond?